How to display day name in different formats in Java? Home Basic Date Questions How to display day name in different formats in Java? Write a program in Java that display day name in different formats. We have to pass following patterns in SimpleDateFormat class that is present in java.text. * package. E or EE or EEE -> Display half day name. EEEE -> Display full day name. How to convert Date to String? * @problem How to display day name in different formats? // Getting current date and time. * u -> day number in Week (1-> Monday, 7-Sunday). * E, EE,EEE -> day name in 3 chars. * EEEE -> Full day name. Output - How to display day name in different formats in Java? 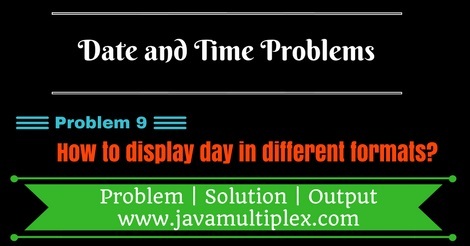 Tags : Date and Time Problems, Display day name in Java, Solution in Java, String, DateFormat, SimpleDateFormat.